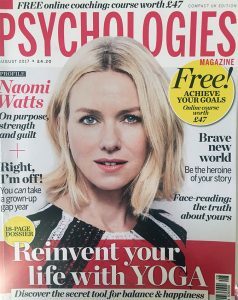 Totally chuffed to see my bestselling 30 day goal setting course on the cover of August issue of Psychologies Magazine. No more excuses to work towards a better self-image, career growth, or to find more time for the things you want to do with my 30 step by step challenges and my GRID framework. Sign up for this short and highly practical course and take 30 steps to a better, more balanced life, your health, work and career.